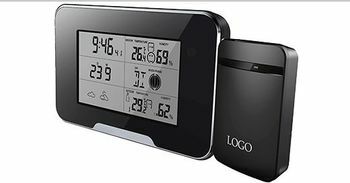 Our Latest State-Of-The-Art Wireless 1080p Hi-Def Weather Station w/WiFi is a multifunction weather station with an integrated 1080P high denition hidden Wi-Fi camera embedded in it. Perfect for home or office use and is even great for 2'nd homes where you would like to keep track of your property and the weather too! 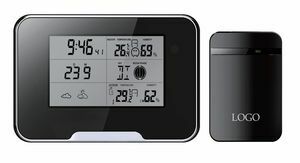 It can be used as a normal weather station to detect and show both outside and inside temperature and humidity. It displays the time, date, and moon phase. With the high resolution full HD video capture and remote viewing via smartphone, this clock allows you to easily check in at any time. The Wifi functionality allows you to view the live video anytime and anywhere. With a microSD card installed, you can easily record without the need for an always-on computer connection. It's easy to view the recorded footage using your computer, iOS, or Android device. The cloud functionality means there is no complicated router configuration to get you up and running for remote viewing.